The Invincible Marching Marauders of Central State University have been voted HBCU Sports Band of the Week for Week 2 for their halftime performance last Saturday at the Chicago Football Classic. In what could be considered a surprise win, if not an all out upset, the Central State marching band managed to garner 64.54 (932 votes) percent of the 1,444 total votes tallied. 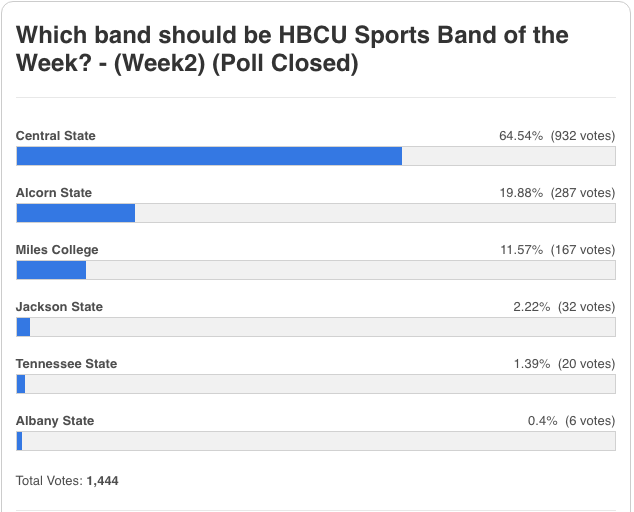 After voting began Thursday, CSU launched a social media blitz that even included a custom banner on the front page of the university’s official website asking supporters to vote for the band for the weekly honor. Alcorn State’s Sounds of Dyn-O-mite Marching Band finished second in the polling with 19.88 (287 votes) percent of the votes, followed by Miles College, Jackson State, Tennessee State and Albany State.